Genesis 3:8 says that they -- the man and the woman, busily sewing up garments for themselves -- heard the Lord God walking in the garden in the cool of the day. Some translations say "at the time of the evening breeze." The idea of wind is there in the Hebrew language. So given the Hebrew play on words where wind and breath and spirit are all the same words, is this saying that the Spirit of God is blowing around the garden? Or is it the pre-incarnate Christ in his physical body walking around in the breezy garden? Or as Martin Luther indicated, is it just that Adam heard the leaves rustling and his guilty conscience drove him to hide? Who knows? But if it's our story, you know as well as I do that it's less important how God gets your attention than that he does in fact get it. How does God get your attention? I've noticed that he does this in a variety of ways. Other times God confronts me through the voice of someone I respect and care about -- my wife, often, or my children. My pastor. A friend who sees past my defenses. Frequently these people have no intention of confronting me with anything, they just comment on the truth they see. I do my best to surround myself with people who speak clearly and honestly about the truth. As they speak from the perspective of their own relationship with God, often the Spirit uses their words to confront me and I face the truth about myself. Another way God often gets my attention is in solitude. One of the things I love about bowhunting is that it includes hours of sitting perfectly still in the woods. Granted, much of my time on a deer stand is given to thinking about deer, and that's okay. (I struggled through this one several years ago, when God made clear to me that he wasn't intimidated or bothered by my love for hunting and for the outdoors. He let me know in no uncertain terms that he created me with that love of losing myself in the wilderness.) But other times on stand, in a canoe, stalking through the woods or holding absolutely still, my mind has time to go quiet and listen. A couple years ago God used the words of a friend combined with an afternoon on a deer stand to let me know that it was time to finish a book, and that was the beginning of my book on the Exodus. Sometimes God gets my attention by thwarting and frustrating my plans. I've wanted to teach a class on my book ever since I first learned that it was going to be published. So three different times I planned for that class, and three different times doors closed and I was convinced that the time was wrong. So I gave up on the idea, convinced that God knew what he was doing. 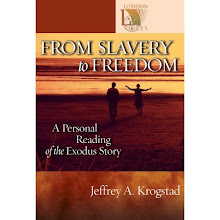 Then, when I didn't expect it, those doors opened and others on the team at Central told me they thought it was the perfect time for me to teach a class on the Exodus, using my book. We just finished the first session of that class today, and it will continue for six more weeks. Great fun -- but the timing had to be right. How does God get your attention? And when he does, do you pay attention, or do you continue to hide? God not only comes walking through the garden, he calls out. He desperately wants a relationship with us. He goes looking. God is a missionary, coming where we are to seek us out. How will you respond when he calls?